* cognitive errors of omission and commission precipitated by inadequate information and/or situational factors -- stress, fatigue, excessive cognitive workload. 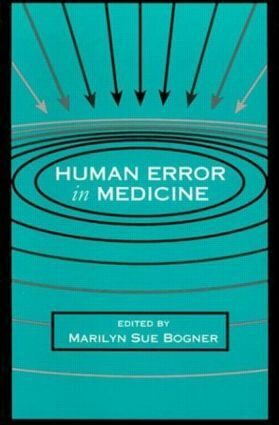 The first to address the subject of human error in medicine, this book considers the topic from a problem oriented, systems perspective; that is, human error is considered not as the source of the problem, but as a flag indicating that a problem exists. The focus is on the identification of the factors within the system in which an error occurs that contribute to the problem of human error. As those factors are identified, efforts to alleviate them can be instituted and reduce the likelihood of error in medical care. Human error occurs in all aspects of human activity and can have particularly grave consequences when it occurs in medicine. Nearly everyone at some point in life will be the recipient of medical care and has the possibility of experiencing the consequences of medical error. The consideration of human error in medicine is important because of the number of people that are affected, the problems incurred by such error, and the societal impact of such problems. The cost of those consequences to the individuals involved in medical error, both in the health care providers' concern and the patients' emotional and physical pain, the cost of care to alleviate the consequences of the error, and the cost to society in dollars and in lost personal contributions, mandates consideration of ways to reduce the likelihood of human error in medicine. The chapters were written by leaders in a variety of fields, including psychology, medicine, engineering, cognitive science, human factors, gerontology, and nursing. Their experience was gained through actual hands-on provision of medical care and/or research into factors contributing to error in such care. Because of the experience of the chapter authors, their systematic consideration of the issues in this book affords the reader an insightful, applied approach to human error in medicine -- an approach fortified by academic discipline. Diagnosis-Related Groups: Are Patients in Jeopardy?